For me, and I think for many of us, planning a voyage is almost as much fun as actually taking the voyage itself. For one thing, it takes longer. All the preparations and anticipation take a lot of time—doing the research, looking at the charts, dialing in the route, not to mention selecting the right boat, the right crew, and the right equipment. As the months become weeks and the weeks become days, the big picture narrows down to the precise details—and in cruising, getting the details right can make all the difference. But the real fun of planning, it seems to me, is more than the sum of the details. It’s all about the dream—and making the dream come true. I’ve been dreaming about this trip myself for quite a while, ever since I took a 35-foot convertible up the east coast from my home port of Norwalk, Connecticut, up to Maine, around Nova Scotia, past Prince Edward Island and finally to the little town of Gaspé, at the mouth of the St. Lawrence River. Now, it turns out, I can do most of the other half of that Down East Loop, up the Hudson River from New York City to Lake Champlain, farther north to the St. Lawrence and then down to Quebec City (which seems more like a misplaced part of France, rather than Canada), then south to Maine, and finally back down the New England coast to Norwalk. At this point, you might be reaching for your map. There’s something wrong here. Quebec City to Maine? That’s where the beauty of this 855-nautical-mile trip comes in. We (photographer George Sass Sr. and I) will be on a new Cutwater 28, a pocket cruiser from Fluid Motion LLC in Kent, Washington (which also makes Ranger Tugs). The Cutwater 28 (like all Fluid Motion boats) is trailerable. After we get to Quebec City, we’ll put it on a trailer and drive it 228 miles down to Maine, where we’ll launch it at Hampden, which is about 20 miles north of Bucksport on the Penobscot River, which then flows down to Penobscot Bay. The neat thing about cruising on a trailerable boat is that it opens up a lot of options. You can figure out where you want to go with a marine chart and a road map. In our case, we’ll have the best of two iconic voyages all in one. The first leg, 495 nautical miles up the beautiful and historic Hudson River to Lake Champlain and Quebec, is a major trip in itself; the second leg, 360 nautical miles down the fabled Maine coastline, with its finger-like peninsulas, deep-blue bays, and rocky outcroppings (not to mention lighthouses and lobster pots), and the entire New England coastline, is also a dream cruise in its own right. With the trailer, we don’t have to go around the Gaspé Peninsula again; we save time without retracing our steps. We have the best of both worlds, and we can cruise quickly and comfortably. With her single 260-horsepower Volvo Penta diesel, the Cutwater 28 should cruise at about 20 knots, achieving about 2 nautical miles per gallon. 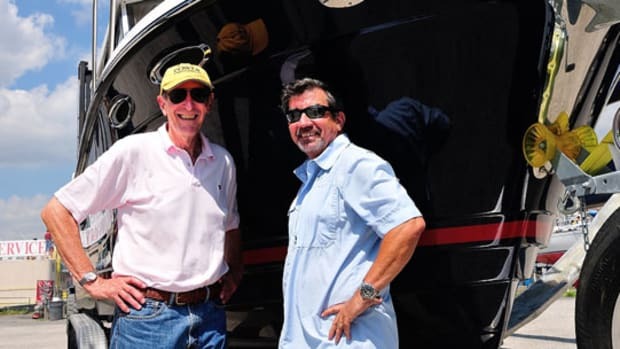 The boat itself will start at the Pocket Yacht Company in Grasonville, Maryland, just across the Chesapeake Bay Bridge from Annapolis, which is the mid-Atlantic dealer for Cutwater and Ranger. 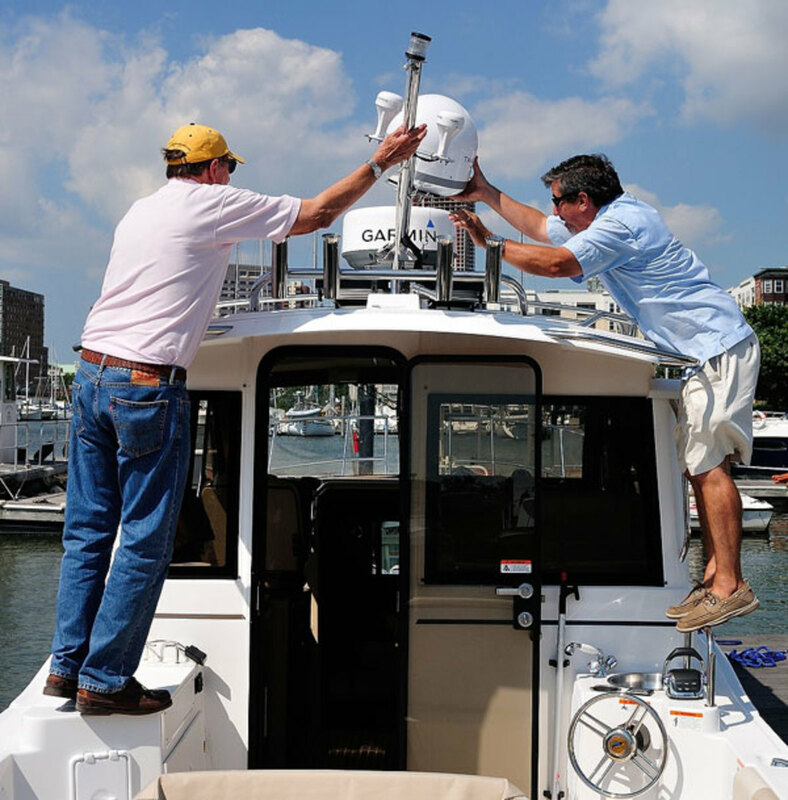 Mark Schulstad, who runs Pocket Yacht, will trailer it up to Liberty Landing Marina in Jersey City, New Jersey, directly across the river from New York City. We’ll launch it there and make a left turn up the Hudson at the Battery, the tip of Manhattan. Here we’ll get an introduction into American history; the Battery itself got its name in 1693 when the British installed 92 guns there to protect the harbor and the river from the French. Then we’ll retrace Henry Hudson’s original voyage up the Hudson River on the HalfMoon in 1609. An English explorer hired by the Dutch East India Company, Hudson was looking for a water route to the Pacific; he got about 134 miles up the river to what is now Troy Lock, just above Albany, before he ran out of water and had to turn around. Along the way, we’ll pass West Point, near where George Washington’s patriots stretched two barriers of heavy chain across the river to prevent the British navy from reaching Kingston, the capital of New York at the time. It didn’t work; the Brits broke the chains and burned Kingston to the ground. 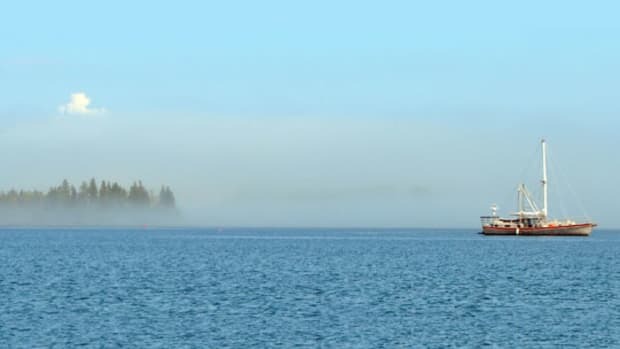 We’ll have to negotiate 11 locks on the 60-mile Champlain Canal from the Hudson to Lake Champlain and then it’s smooth cruising across one of the most beautiful inland bodies of water in the United States. 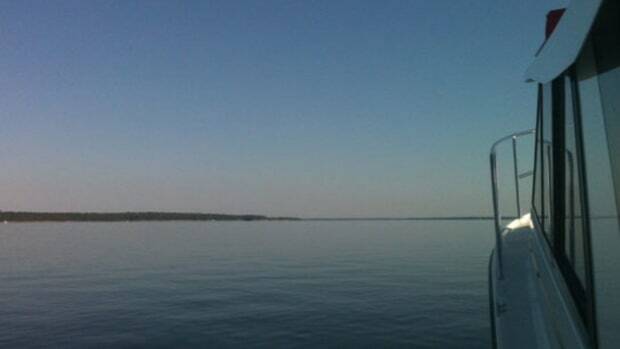 Dotted with more than 70 islands, Lake Champlain is 12 miles wide at its widest and about 125 miles long, with Vermont on the east side and New York on the west. 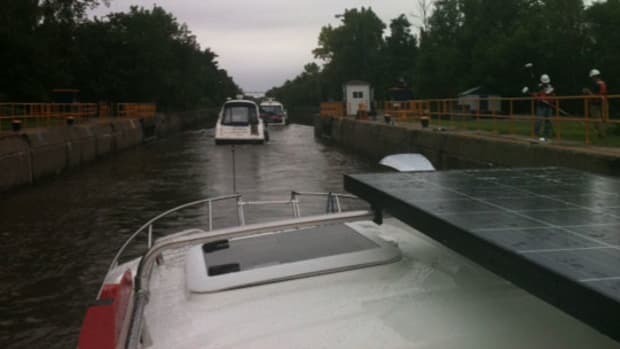 Just beyond the top of Lake Champlain, we’ll clear Canadian Customs and enter the 70-mile-long Chambly/Richelieu Canal, which has 10 locks and ends at the commercial shipping town of Sorel, on the St. Lawrence. From there it’s about 100 nautical miles downstream to Quebec City, the only walled city in North America where the British outfought the French in 1759 to take over Canada, although the French language, heritage and lifestyle are still strong in Quebec. 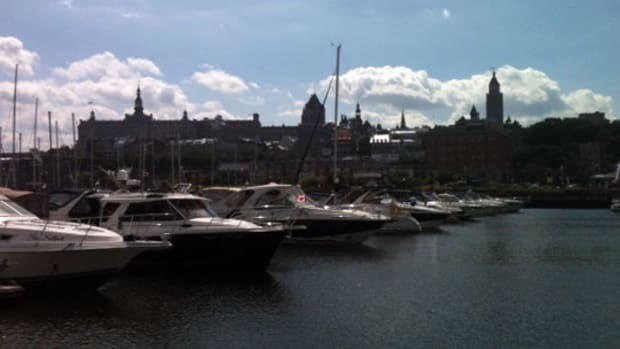 We’ll head for Marina Port Quebec, a large marina with 415 slips (and a launching ramp) at the foot of the city’s historic district, and I’m sure we’ll find time to stop at a nearby sidewalk café along the ancient city’s cobblestone streets. Meanwhile, Dayton Trubee, who works for Schulstad, will drive up to Quebec with the Cutwater’s trailer, and we’ll pull the boat out and trailer it down to Hampden, Maine. 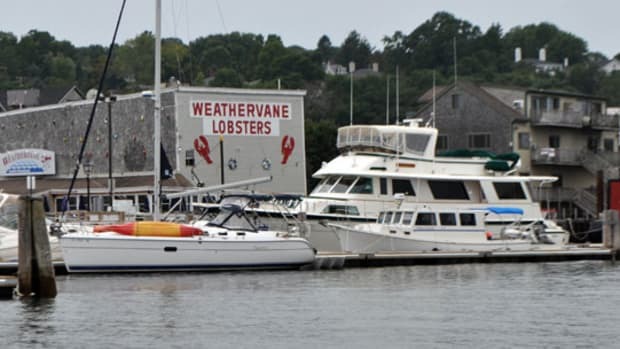 Dan Higgins is the new Cutwater dealer at Hamlin’s Marina there; Hamlin’s also has both a boat ramp and diesel fuel. 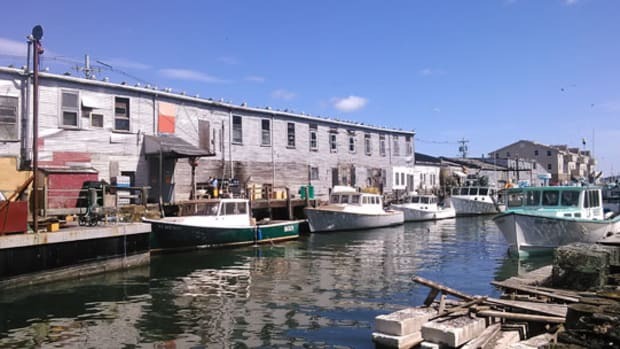 Then we’ll start the last leg of our epic cruise back home, perhaps stopping at Camden or Rockland on Penobscot Bay or down in Boothbay or more likely in Portland, Maine. We’ll head through the Cape Cod Canal with perhaps a stop at Newport or Mystic on the way home. Whatever exact route we choose, we’ll be going through some of the most scenic cruising grounds in the United States; we can’t lose. 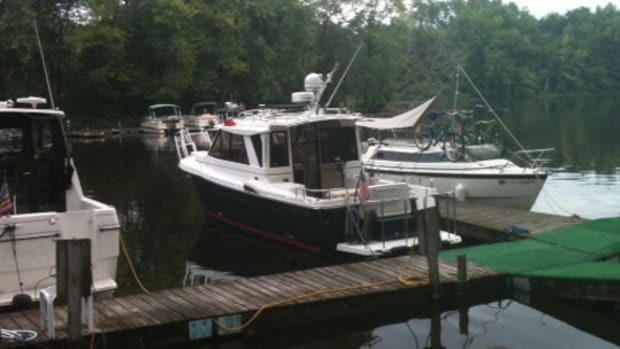 Cutwater’s also are known for packing a lot of amenities into a smaller package. The 28, for example, has a V-berth that can sleep two in the forward cabin, but there’s also a seven-foot double berth tucked below the dinette as a separate sleeping area for a second couple. On the port side in the saloon, the companion seat folds forward to extend the galley countertop; on the starboard side, the doublewide helm seat also reverses to serve as a dinette seat. Below the water, there’s a rounded shoulder on either side of the keel—a bulge in the bilge, really—so the engine can be mounted lower in the hull; this makes for a lower center of gravity but it also allows for a lower profile of the main cabin. We’ll have much more to write about on the Cutwater 28 and our Down East loop shortly, after our plans take to the water. All these plans depend, of course, on many variables—primarily the weather, the boat, and the crew. As we all know, the best-laid plans … Still, we’ll give it our best shot. A long-held dream is certainly worth every effort. Stay tuned and follow us here ▶.